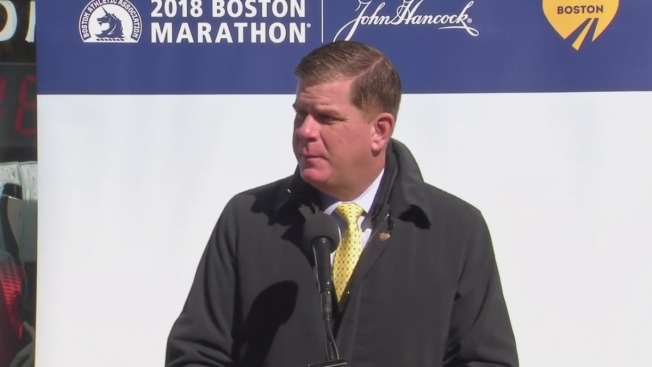 Mayor Marty Walsh said the Boston Marathon is one of the city's oldest and proudest traditions during the unveiling of the 2018 banners on Monday. The banners for 2018 Boston Marathon were unveiled Monday morning in Boston by the Boston Athletic Association. Over 500 banners will line the 26.2-mile journey from Hopkinton to the city's Back Bay neighborhood when runners take their mark on April 16. Among those who attended the unveiling at Marathon Sports on Boylston Street was former marathon legend Will Rodgers and top American marathoners Dathan Ritzenhein and Shadrack Biwott. Officials with John Hancock, a principal sponsor of the marathon, were also on hand to talk about this year's theme, "Together Forward." "Our marathon theme, Together Forward, exemplifies our collective experiences in organizing, supporting and participating in an event that challenges us to be our best, because it demands us to be at our best, not only on Marathon Monday but in every moment leading up to race day," John Hancock Executive Vice President James Gallagher said. Boston Mayor Marty Walsh echoed those sentiments, adding that the marathon is one of the city's oldest and proudest traditions. "We know the marathon isn't just a tradition — it's an event that represents the resilience of the human spirit," Walsh said. This year will be the 122nd running of the Boston Marathon.